The number of personnel in the forces is not only not increasing due to greater demand but recruiting rates are slowing whilst "quit rates" accelerate, according to a comprehensive National Audit Office report. "The Army’s strength was 100,010 personnel – a shortfall of 1,790 personnel (1.8 per cent), which was within manning balance. The Royal Navy remained below manning balance, its strength was 35,470 personnel – a shortfall of 1,310 personnel (3.6 per cent). The Royal Air Force was also below manning balance – its strength was 45,210 personnel – a shortfall of 2,080 personnel (4.4 per cent), having made a tranche of redundancies in April 2006. All three Services expect to be within manning balance by April 2008, but are experiencing shortfalls in the intervening period." "This damning report confirms what we have been saying for some time. The gap between our commitments and our resources is growing and putting unacceptable pressures on our service personnel and their families. The Government cannot continue like this - if the Prime Minister is going to continue making commitments then the Chancellor must be willing to foot the bill." Royal Marines and medical staff are particularly dissatisfied with their jobs - people that are crucially important. Dannatt wasn't kidding about the Army running hot, I just hope that we can still stick around in Iraq and "the Stan" to do the job. Maintaining our defence capability is the primary duty of any state and underlines this government's failure. They are forced to rely on the TA having stupidly cut it over the period 1997-2001. The Services medical service is in meltdown and wholly reliant on a TA component but no doctor can afford to put his career on hold indefinitely and this will severely affect future recruitment. Dannatt was absolutely right and this report backs it up. Blair was also bare faced lying when he said he agreed with Dannatt. Privately, Number 10 was severely pissed off at the comments. The NAO does a great job and I hope that the Government will finally face up to the problems it created. Does anyone consider it sensible that we merge the 3 arms into a single entity given the types of engagement that we are likely to undertake? Surely having a structure similar to the USMC where they have naval and air support under one umbrella would make sense as well as ensuring that we have the right kit for the job (knowing that we have an issue with air support for troops, but have plenty of fight aircraft to engage Soviet fighters with). Sir Richard Dannatt was right to speak out because no one in this government seemed to be listening! All those people who complained about his interview being inappropriate even if he was stating facts just did not get the message. I far as I could tell he was telling the government and us that the military could not sustain the level of commitment this government wants on the resources and troop numbers at his disposal. A question for all those Labour politicians who bleated on about loyalty to troops meaning that no enquiry could be held in Iraq. How many of you know what the gap is now for the soldiers between active service deployments? What was it pre 97'? Would the enquiry have covered troop deployment numbers and resources required being inadequate for the job in hand, it might also have shown a complete lack of preparation regarding adequate suitable equipment too. Would it be disloyal to the troops to make sure that we don't put them in that position again. 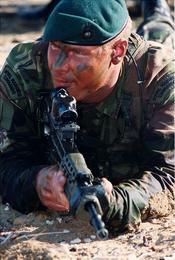 the strength of the British Armed forces has been their regimental & service set-up. politicians & efficiency experts underestimate the influence of those. I do wonder however how the US has such well equipped forces when it spends less per man (regular & reserve) than do the British. The UK is 3rd (or fouth depending on Russian spend) largest spender on defence and per regular/reserve spent $192,000 in 2005 v $177,000 in US. Could it be the size of MOD and associated non-front line costs? Not me. Canada tried it in the 1968 by merging the services into one body "Candian Forces" with common ranks, uniforms etc. Total farce. Although they are now still separate "Commands" within a single Force to all intents they have been demerged again. Like Concorde and the NHS it's one of those brilliant ideas that nobody else wants to copy. Nice of the NAO to expose the myth of NuLab's propaganda blitz. B-Liar keeps on saying that he has spent squillions on the forces and they have the best of everything, his Cabinet colleagues also say the same. So if the NAO, and Richard Dannart the Army Chief, disagree with the disinformation disseminated by NuLab does that mean we have been lied to? More importantly does that mean that Parliament has been lied to?, or misinformed?. That is a more serious affair and can lead to official enquiries and censure. I trust that the Lib-Dems will join with the Conservatives in taking this forward and ensuring that B-Liar is given a serious kicking in the marital prospects. I'd like to point out to anon we don't have to keep anything back to take on Soviet fighters, UMMMM the Soviet Union no longer exists, it was in all the papers. That is the problem, we still have armed forces geared up to fight a potential enemy that is no longer there. A Navy chasing submarines that are rotting away in Murmansk. The Airforce is still waiting for manned bombers to come sweeping in over the North Sea, they are sitting on Russian airfields with empty tanks. Inter-service rivalry is the major reason why the armed forces are having problems. Each service fights for the maximum cut from the defence budget and spends it often on weapons and equipment which it no longer needs. It is obvious that the Army is now the premier service, the Airforce and the Navy will do anything, rather than recognise that. Resources should now be directed away from many of the pointless things both the Navy and Airforce are doing, and to the service which is actually engaged in a conflict. Much of the Airforce's role can be handed back to the Army .helicopters and close support, should never have been taken away in the first place. Such things as fishery protection could be handled much better by a proper Coastguard, than the Navy. Ted spending is irrelevant. Buying Eurofighter or an aircraft carrier makes Britain's small armed forces look highly funded. There are 25000 frontline fighting infantrymen - that is all - 13000 deployed with 12000 to rotate which means deployment every 6 months. The Royal Navy lifted 3 times as many men off the beaches in Dunkirk as constitute the entire British Army today and I bet we couldn't even move 327.000 men today in the tiny Royal Navy. Britain is Ruritania playing The Mouse that Roared and should not try to interfere in matters around the world with this shoestring military. Dunkirk was not a defeat - but Singapore was - the largest surrender of British forces in history; because the defences of Singapore had been neglected throughout the 1920s Budget cuts by The Treasury and leadership by a staff officer who sent thouands of men into Japanese camps.